Today, Rubios is a major west coast chain, and the fish taco has caught on all over the place – even in Boston. No Rubios here yet, but we have Dorado Taco in Brookline, which serves them just like in Mexico and southern California. 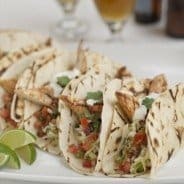 Fish Tacos are a nice twist on traditional beef, chicken, or bean tacos. I think they’re super easy to make, and lighter and healthier tasting. You can serve them with salsa or pico de gallo, but I really love the traditional cabbage slaw with Mexican Crema, a cool, creamy sauce. I’ve been making this recipe, adapted from the Culinary Institute of America, for a while. 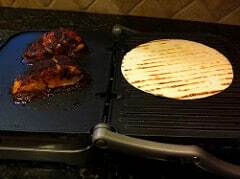 It’s easy to prepare on the grill or stovetop, but I prefer to use my Panini Press , because the fish doesn’t fall through the grill, cleanup is easy, and I get those nice grill marks on my tortillas. Cut the fish into 16 equal pieces. Combine the oil, lime juice, chili powder, cumin, coriander, garlic powder and salt in a bowl. 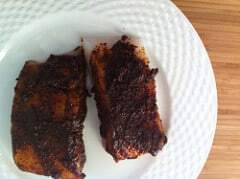 Coat the fish with the rub/marinade and let sit for 30 minutes. 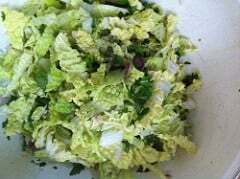 Meanwhile, make Pico de Gallo (if desired) and Cabbage Slaw. Combine all ingredients in a bowl, stir to combine, season with salt and pepper. Let sit at room temperature, for 30 minutes to allow flavors to combine. Combine lime juice, honey, onion, jalapeño, cilantro, salt and pepper in a bowl. Toss with shredded cabbage, and refrigerate for 30 minutes. Zest and juice 1/2 lime. Stir yogurt or sour cream into zest and juice. Add a pinch of salt to taste, and cilantro if desired. Grill the fish on the first side over direct heat, until the fish starts to turn opaque - 2-3 minutes. Turn the fish, and grill until cooked through, about 2 minutes more. Meanwhile, grill the tortillas until they have light grill marks, and are heated through on both sides. 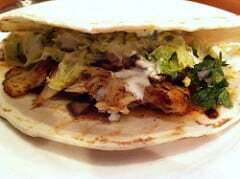 To serve, center 2 pieces of fish on each tortilla, top with Cabbage Slaw, and Pico de Gallo.